A large Chinese double handed falchion of a form that is both related to the niuweidao and dadao . Its blade is long and practically straight until the tip flares out at the end to create an accelerated curve with lots of steel behind it, optimized for cutting unarmored opponents. The blade has two grooves, with a segmented groove in-between: A feature inspired by Chinese officer sabers of the 18th and 19th century, which in turn were inspired on Islamic swords with this feature. Despite the somewhat rough finish of blade and grooves, the actual forging is quite nice. On some places the surface reveals a nice, consistent wavy pattern with many fine layers and an inserted, high-carbon edge plate exposed at the edges. The right side of the base of the blade carries an inscription: 南强合村 ( nán qiáng hé cūn ). As often the case, it's a bit of a puzzling inscription that can mean several things. Today, there are several villages in China that are called nán qiáng cūn (南强村). They are located in Guangdong, Sichuan, two in Shaanxi, and one on the island of Hainan. I suspect the inscription refers to a local militia unit, perhaps connected to one of these villages. There is also a village called nán yì hé cūn (南义合村) in Shandong. The change from qiáng (strong, brutal) to yì (virtuous) may be a stretch, but Shandong is where the Boxer Uprising originated, from local martial arts circles, and I wonder whether towns with too martial names may have actually changed their names after their defeat. It's something that is worthy of further research. If I had to guess from the form of the blade, it's definitely northern and Shaanxi and Shandong are both plausible places of origin. On the left side of the blade has a chiseled design of a floral motif. I like the execution, deep and strong. The spine is decorated with a series of cuts, a feature often seen on northern Chinese blades. Some are regular and make the spine resemble bamboo, while others are less regular and almost look as they hold some sort of code, like this one. I have yet to find any more information on these markings. 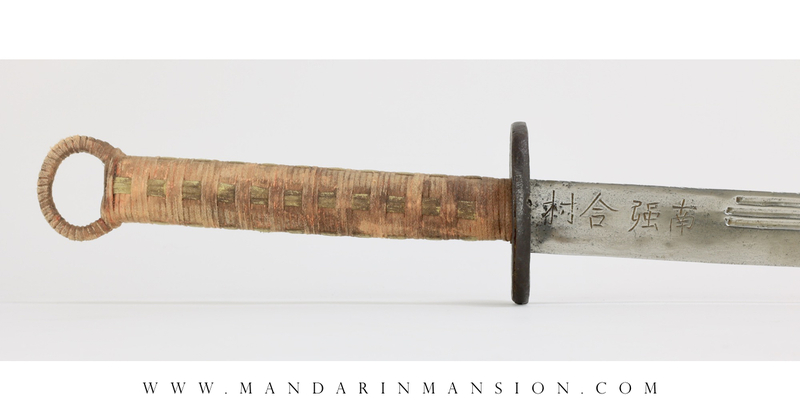 The hilt is an earlier form of what later becomes the standard on early 20th century dadao . Almost round in cross-section, with a ring pommel. It has a large, sturdy iron guard with thick flange. The flange has cutouts on four sides, with a series of notches left and right. All have four notches flanking the cutout, only on the edge the cutout is accompanied with three notches on either side. It seems deliberate and purposeful, but its meaning eludes me at this point. The grip wrap is new. It's an old wrap done by myself for a collector, about a decade ago. Yes, things certainly move around in our circles! The blade has two nicks at the "sweet spot", and there is a recess at the edge contours there indicating it was not the first time that place was hit. This is most likely old combat damage, polished out, and damaged again. There are some perpendicular cracks at the spine opposite the nicks, this is part of high carbon steel that cracked under stress of quenching or as a result of a hard hit. The surrounding steel is very tough, so these are not a problem on a blade like this that remains structurally sound. Despite the oblique positioning of the guard, the hilt is tight. This is oddly, by design: The shoulders of the blade are uneven. 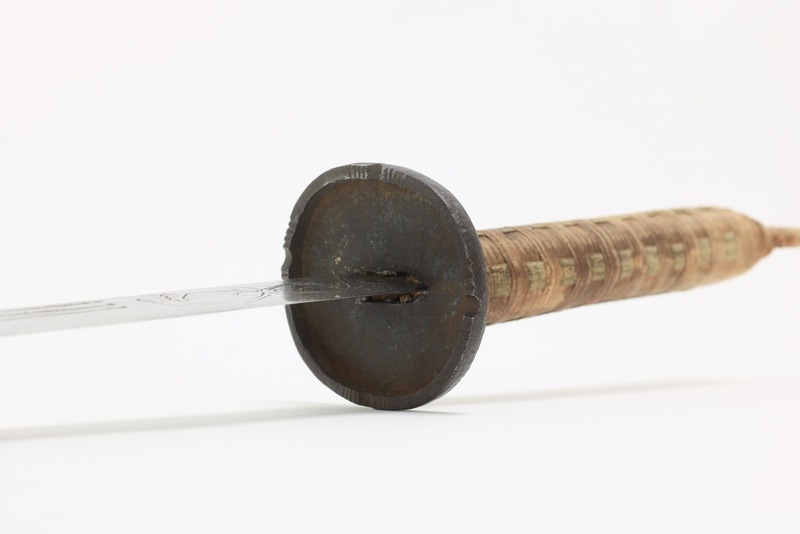 A pretty good example of a 19th century civilian dadao , a type of weapon used by local martial artists, rebels, and their enemies: the militia who sought to protect their towns. This piece has a marking that suggests it was once used by a village defence militia. The well-forged but roughly finished blade with actual battle damage adds to its charm.